Size: Up to 20 feet or more. Growth Form: Shrub or tree; multiple trunks from base, rarely single trunk; bark gray and thin, ex-foliating in thin strips; outer layers persistent. Leaves: Green; whorled in 3's; scale-like, closely appressed; gland obvious. Flower Color: Non-flowering species; cones only; gymnosperm; dioecious, rarely monecious; pollen cones terminal, seed cones also terminal; seed cones spheric to ovoid bluish, maturing brown-blue to red-brown in year 2. 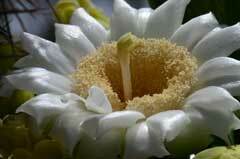 Flowering Season: November to February for cone development; non-flowering gymnosperm. Elevation: 150 to 4,500 feet. Habitat Preferences: Dry slopes, flats, pinyon-juniper communities and Mojave desert-scrub. 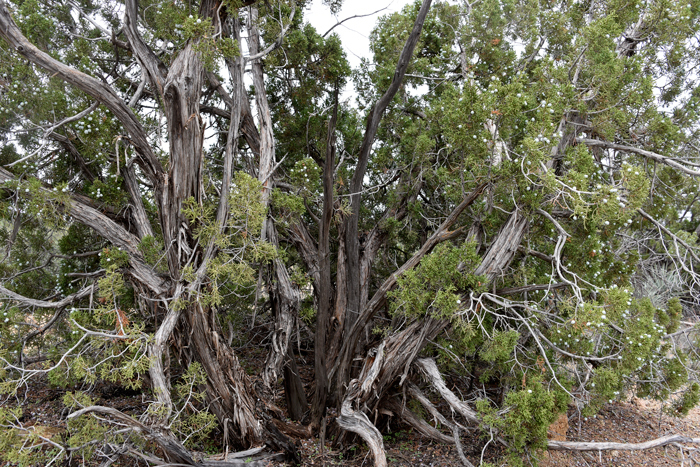 Recorded Range: California Juniper is found in the far southwestern United States in AZ, CA, NV. It is also native to Baja California. North America & US County Distribution Map for Juniperus californica. 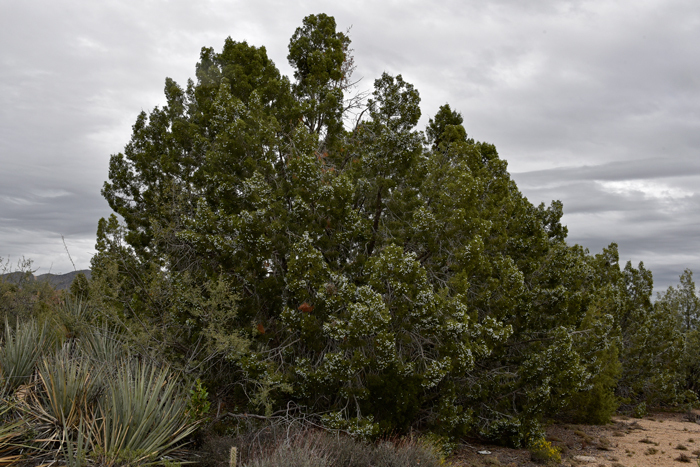 Threatened/Endangered Information: In North America, California Juniper, Juniperus californica is "Protected as a Cactus, Yucca or Christmas Tree" by the State of Nevada. Genus Information: In North America there are 30 species and 43 accepted taxa overall for Juniperus. Worldwide, The Plant List includes 75 accepted species names and a further 394 scientific names of infraspecific rank for the genus. 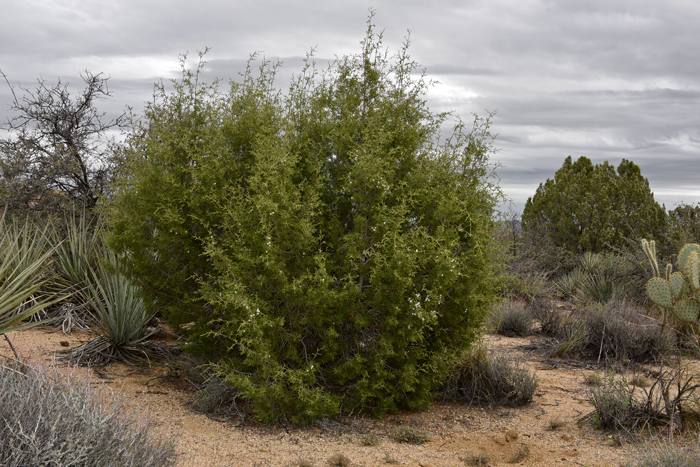 In the Southwestern United States: Arizona and New Mexico each have 8 species of Juniperus, California has 5 species, Nevada has 6 species, Texas has 8 species, Utah has 4 species. All data is approximate and subject to taxonomic changes. Comments: California Juniper is an important species, providing food and/or shelter for, among other animals deer, elk, pronghorn and Merriam's turkeys. Both birds and mammals readily feed on the annual berry crops. For a comprehensive thoroughly documented review of Juniperus californica see the USDA USFS Fire Effects Information System, or FEIS. Butterflies and Moths of North America (BAMONA); California Juniper is a host plant for Sequoia Sphinx moth (Sphinx sequoiae) larvae. In Southwest Desert Flora also see: Redberry Juniper, Juniperus coahuilensis, Alligator Juniper Juniperus deppeana, Oneseed Juniper, Juniperus monosperma, Utah Juniper, Juniperus osteosperma and Arizona Cypress, Cupressus arizonica. Ethnobotany Ethno-Herbalist: Southern California Ethnobotany; Ethnobotany of Southern California Native Plants: California Juniper, Juniperus californica. 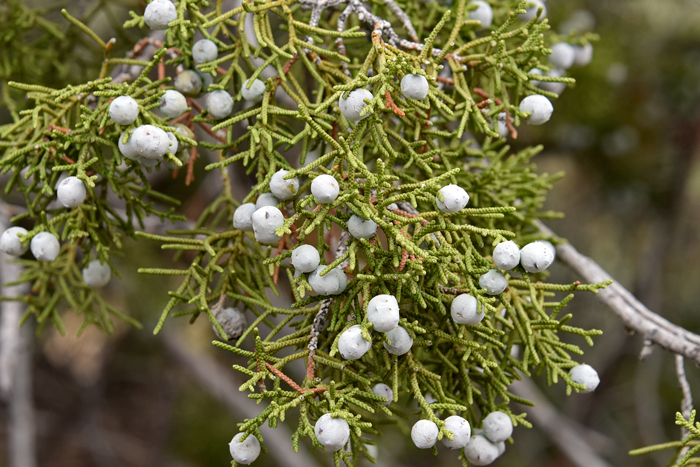 California Juniper has been used for food and medicine purposes by southwestern United States indigenous peoples. Apache, White Mountain Drug, Anti-convulsive; Scorched twigs rubbed on body for fits. Apache, White Mountain Drug, Cold Remedy; Infusion of leaves taken for colds. Apache, White Mountain Drug, Gynecological Aid; Infusion of leaves taken by women previous to childbirth to relax muscles. Cahuilla Food, Porridge; Dried berries ground into a flour and used to make mush or bread. Diegueno Drug, Hypotensive; Infusion of leaves and bark taken for high blood pressures. Kawaiisu Food, Bread & Cake; Berries seeded, pounded into a meal, moistened, molded into cakes and dried. Kawaiisu Other, Hunting & Fishing Item; Wood used as the primary material for making bows, either self bows or sinew backed. Mahuna Drug, Febrifuge; Infusion of berries taken or berries chewed for grippe fevers. The Plant List (2013). Version 1.1. Published on the Internet; http://www.theplantlist.org/ (accessed 06/25/2017). Native Plant Information Network, NPIN (2013). Published on the Internet http://www.wildflower.org/plants/ [accessed: 06/25/2017]. Lady Bird Johnson Wildflower Center at The University of Texas, Austin, TX. Robert P. Adams FNA FNA | Family List | FNA Vol. 2 | Cupressaceae | Juniperus; 10. Juniperus californica Carrière, 3: 352. 1854.; Flora of North America Editorial Committee, eds. 1993+. Flora of North America North of Mexico. 16+ vols. New York and Oxford. Bartel, Jim A. 1994. Vascular Plants of Arizona: Cupressaceae. J. Ariz. - Nev. Acad. Sci. Volume 27, 195-200. Cope, Amy B. 1992. Juniperus californica. In: Fire Effects Information System, [Online]. U.S. Department of Agriculture, Forest Service, Rocky Mountain Research Station, Fire Sciences Laboratory (Producer). Available: http://www.fs.fed.us/database/feis/ [2017, June 25]. BAMONA; Butterflies and Moths of North America; Collecting and sharing data about Lepidoptera; (accessed 06/25/2017). SEINet synonyms, scientific names, geographic locations, general information - (accessed Juniperus).